The first time I saw a rat roaming about freely in the world, I was in Ontario and I was about 30 years old. The little guy was running in circles - I'm still not sure if it was a wild rat that had been poisoned or one that had escaped from a lab at the university - but it was still a memorable experience. To some people, I expect this seems odd - Why would a rat sighting be notable? And, how could you be 30 and not have seen a rat? - but, you see, there are no rats in Alberta and there haven't been since the 1950's. Yes, you read that correctly - no rats. 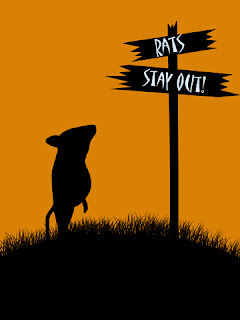 Alberta Agriculture and Rural Development even has a Rat Patrol - no, I'm not kidding. One of the recent skirmishes between Albertans and rats even had a military-esque name: "Operation Haystack." I suspect we are the only place in the world where a rat found in someone's garage or in the local landfill would make headlines, but it does. When rats try to invade (they usually stage their attacks from the east), it makes headline news. The papers and TV news broadcasts show footage, sending out reporters to cover the breaking news and everything. A lot of news folks have covered the stories, including the National Post, Yahoo!News, CBC News, Globe and Mail, CTV news, The Wall Street Journal and Huffington Post. I haven't seen the animated film Ratatouille, but I have it on good authority that even they mention Alberta and its rat-free status. I guess if you are going to be known internationally for something, being a rat-free zone isn't so bad. If you write a book set in Alberta, you need to know this quirky little rat fact. You see, a few years ago, I started reading a book, which was set in Edmonton, the capital city of Alberta. On the first page, the character saw a rat in an alley and reacted like that was a normal thing. I couldn't make myself read past the first scene because that rat sighting kept haunting me. Perhaps that was a stupid reason to put down a book, but it made me question whether the author knew anything at all about their setting. My irritation, I realize, may have been unfair - this rat-free status is apparently a bit of a novelty, so perhaps it is unreasonable for me to expect someone to fact check whether or not a rat would live in an Edmonton alley - but I still couldn't make myself continue reading. Perhaps the rest of the scene wasn't well-written enough to get me over that inaccuracy, I can't remember now ... I only remember the rat. Have you ever stopped reading a book because the author got a fact or detail wrong? Well, first I have to say that is one extremely quirky fact about Alberta and I never would have guessed it. I clicked on some of the news links too. The 'rat thing' has really had it's share of headlines! Hmm...I don't think I've ever stopped reading a book because of facts I knew weren't accurate, but I'm sure I lost some respect for the author. I can't think of anything off the top of my head, but I know I've encountered it in the past. Thankfully, not very often! Do they have mice? I've never heard of a city that didn't have rodents. Of course, I live in the South and we have mosquitos the size of rats. LOL.